The Standard American Diet (SAD) is making us sick. Learn which foods lead to obesity and a myriad of health problems, and which foods to choose instead. The Standard American Diet is making us a nation of overweight and sick people. More than 2/3rds of our nation is considered overweight or obese, costing us a staggering $190 billion a year in obesity-related health care costs. In my opinion, the economic cost is the least important factor here. Happiness. Life fulfilment. Freedom. Health is all of these things. I’d love to live in a country that does more to encourage healthy eating habits and helps set us up for success, but the reality is, our government subsidizes farms that produce wheat, corn, soybeans and rice, foods that are genetically modified, and are most often processed into products that have proven to be detrimental to health. The subsidies make these foods (and their products, like high fructose corn syrup) cheaper, making them more accessible and more economically attractive. If you’ve read My Road to Health, you know that I haven’t always been the picture of health. The two sides of my family are completely different when it comes to lifestyle choices. One side of my family suffers from serious health problems, related to obesity and the SAD. The other side of the family is active, and even before it was “cool” or called clean eating, were great examples to me of the power of healthy choices. I was more than 50 pounds overweight as a teenager. My mom actually cooked a lot healthier than what is typical for an American family, but even so, through a combination of genetics and lots of illness due to my allergies and asthma, I found myself obese at a very young age. I knew from the time I was a young teenager that I needed to be in control of my own health. I needed to make healthy food choices and stay active, because I refused to live my life restricted by my weight. I broke free from the SAD, and if you’re ready to make this change, download a free copy of The Clean Eating Detox for tips to transform your diet to Clean Eating. 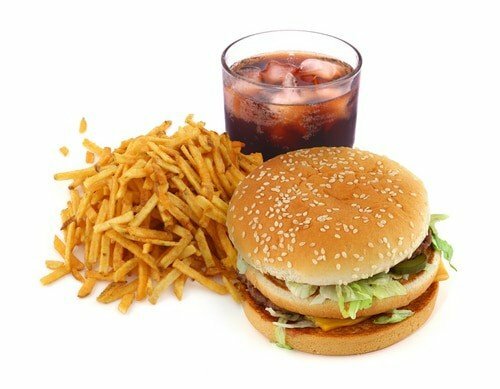 The Standard American Diet (SAD) is what a typical American eats. This diet is low in fiber, low in fruits and vegetables, high in animal fat, high in saturated and hydrogenated fats, and high in sugar. I have no issue with any of the meal suggestions on this list. All of these things CAN be healthy, if ingredient lists are paid attention to, or the items are made at home. The problems with this diet are 1)., it relies too heavily on wheat (read more here about why too much wheat isn’t a good thing), 2) too many of the foods are processed, and not in their natural state, and 3)., there are barely any fruits or veggies! The sad truth is that this sample diet is all too familiar for too many Americans. A whopping 63% of the calories consumed by Americans come from processed foods, while only 12% come from plant foods — and, yikes! — half of those calories are from french fries! These scary stats mean that for the majority of us, only a small percentage of our diets come from the foods that heal our bodies and promote our health- fruits, veggies, nuts, seeds and whole grains. It’s not a wonder that in the US, $1 billion a DAY is spent on cardiovascular disease, much of which can be prevented with diet and exercise. Once you begin cooking homemade meals, and start centering your diet around fruits, veggies, whole grains, nuts and seeds, and lean proteins and fish, you’ll find your body actually craves these things. I need them to feel satiated — my body expects nutrients at meal times, and feels unsatisfied when it gets processed junk instead. Let’s look at the SAD day of meals above, and create a day of eating similar foods, but the Clean Eating way. Lunch: A salad with tons of veggies, beans, eggs, quinoa, and a really tasty zippy dressing. Dinner: A gluten free, clean eating pasta, with a protein and veggie packed sauce. 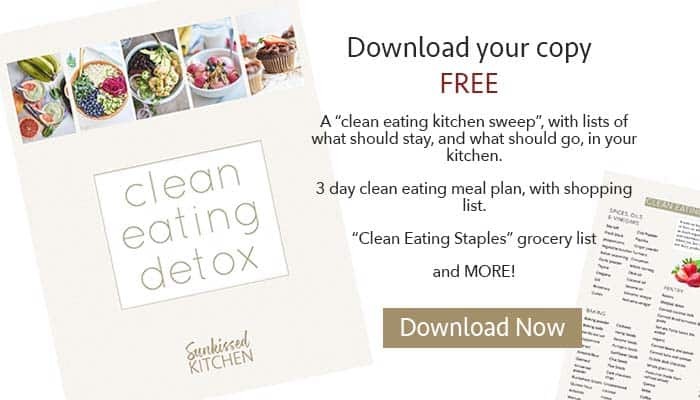 If you’re just starting out on your clean eating journey, I’ve put together an eBook, The Clean Eating Detox, to give you some tips and tricks for cleaning out your kitchen, and setting yourself up for success with a Clean Eating Lifestyle.